With sizes between 4 to 40 centimeters, shaped into typical meteorite forms by wind corrasion and coated with the velvety glaze of desert varnish, the dark silcrete fragments were practically indistinguishable from an unweathered fusion crusted meteorite. Nevertheless we gave it a try, but soon found that the rocks were simply too abundant to diligently check even a fraction of them and so we had to simply give up. The fact that these dark silcretes were evenly distributed on the surface with wide enough spaces between to not form a single monochrome blanket, provided a worst case scenario that rendered any attempt to prospect for meteorites in this area pointless. We dubbed the silcrete field ‘The black pest” and swung around, in order to carry out another traverse to the south, parallel to the determined axis of our predicted strewnfield. Later that day, Andi, who was the last of us without a find of his own, decided that he’d try a solo walking approach. After we had determined a pick-up point in two hours, I wished him good luck and left him on the plateau. My own course took me to a narrow high-terrace of the Gart Aouirtefou, which we had not searched yet. When I returned in the late afternoon I was glad to see him still walking the selected grid. I was even happier when, at the sight of the car, Andi started to wave and to jump, which, unless he hadn’t suffered a sun stroke, was an unmistakeable sign that he had finally found himself a meteorite. While all finds of the team, minus the mandatory deposit samples, were shared equally between the car crews, it was still a matter of personal importance to us whether a meteorite was found in a combined team effort or whether one actually had the fortune to make a find oneself. Andi had indeed found a space rock. And not only one, but an area littered with fragments. After receiving my due congratulations he told me, that half an hour after I had left, Thomas and Rainer had passed by in their rather quick regular search speed. When he had reached the tracks they had just left, he had spotted a meteorite right next to them, then another and yet again another. He had left the stones in their in situ positions for me to see and indeed, Thomas had passed the closest fragments only by a meter without spotting them. This, however, was understandable. Rainer, who had manned the co-driver seat, would have had to look straight into the direction of the sun to see them and from such an angle, it was hard if not impossible to tell the difference between the dark side of a local rock and a meteorite. Andi also pointed out numerous shards of Neolithic pottery and ostrich eggs between the meteorite fragments. Both pointed to the fact that the shallow drainage channel at some point intersected a prehistoric settlement. It was due to the very low angle of inclination, probably only a few centimeters per mile, that the meteorite fragments together with the artefacts had not been washed down into the valley. After taking down the coordinates and updating the find logbook we searched the wider surroundings on foot. 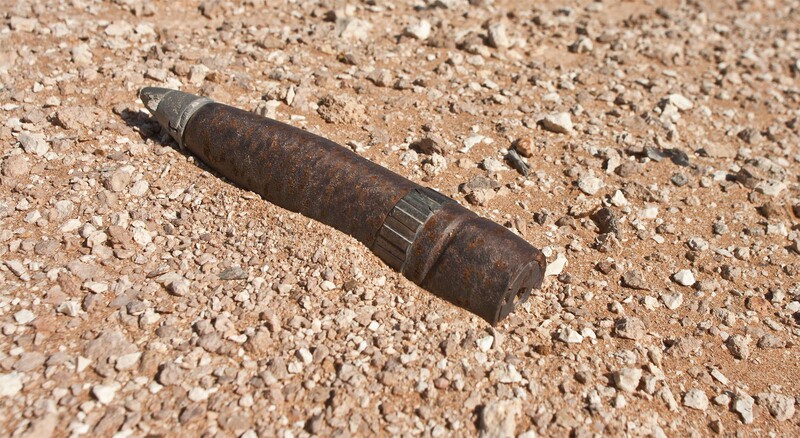 This lead to several more meteorite finds. The last piece that I picked up was a nice 400g fragment, badly weathered, but still displaying nice regmaglypts on one surface, which gave a faint idea of how beautiful the atmospherically sculpted meteorite must have looked shortly after its fiery descent. During the day I had taken elevation measurements in short intervals. My working hypothesis was that the dense concentration area we had found was situated on a watershed. If this was true, the low erosion gradient of the surface might play a crucial role and this in turn was a relevant factor for the in situ preservation and weathering gradient of meteorites exposed on the surface over geological periods. While the present time erosion in the area was minimal and rather caused by aeolian deflation, it was obvious that hydro-abrasive activity had played a much bigger role during the more humid phases. Particularly those meteorites deposited during or prior the late Pleistocene wet phase between 40 and 20 ka ago and the Holocene wet phases between 10 – 5 ka ago were affected by a higher degree of hydrodynamic activity. 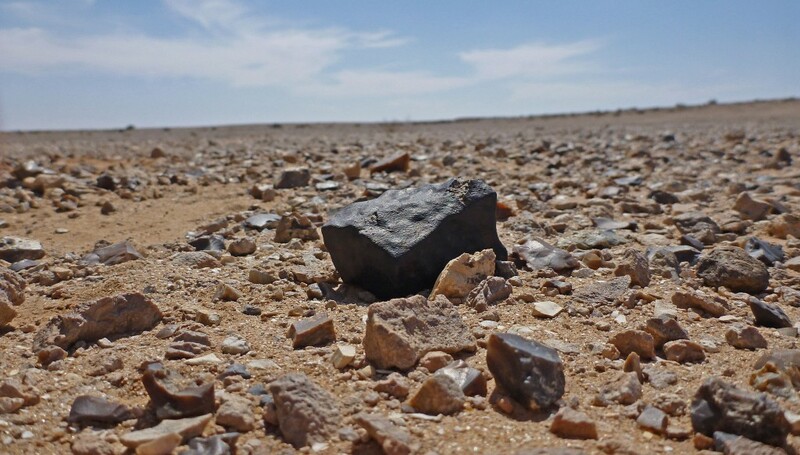 Displacement of surface rocks by the drain off of heavy rains as well as mechanical abrasion during the pluvials catalyzed the chemical and mechanical weathering processes a given meteorite population was subjected to. Perhaps hydraulic gradients were a more important factor controlling the accumulation of meteorites in certain areas over time than previously thought. Unfortunately the satellite images and the topographic charts showed the orientation of the local drainage systems only to a very limited extent. More data was necessary, and I was confident to gather the necessary evidence, if not on this trip then on the ones to follow. At the time the others arrived, Andi and I had collected well over 2 kilos of meteorite fragments. Rainer sampled a specimen with the SM-30 and, as could be expected, the magnetic susceptibility of Andi’s find matched those of other weathered chondrites from the nearby find locations. Although with temperatures around 59°F it still felt pleasantly warm, the wind on the open plain had suddenly picked up and after a couple of minutes the sand blowing horizontally into our faces stung like needles. After ten days in the desert the team was on its last legs. As far as I was concerned, I had gotten used to life in the field and now that I had my improvised styrofoam insulation matt, the prospect of spending another night in the cold didn’t daunt me at all. As long as we were finding meteorites I could see no reason to withdraw. 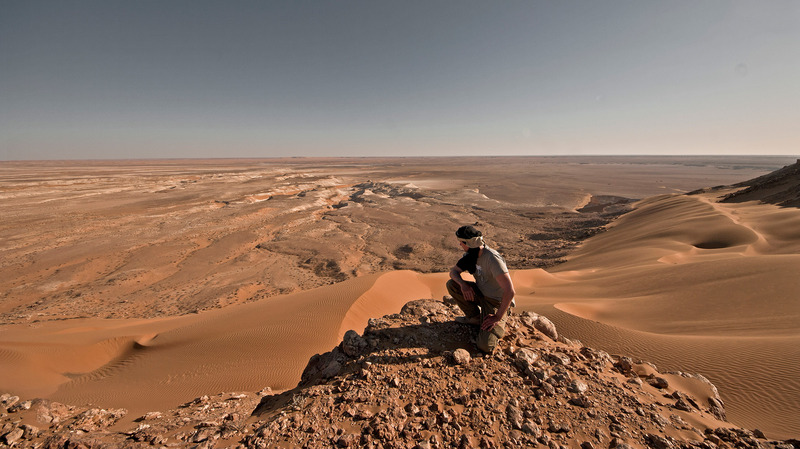 After ten days in the field our clothes had more or less taken on the colour of the surrounding landscape. Every time one of us stepped in the wind a trail of dust would come off. Our gang, me included, was unshaven, our clothes were sooty and bore the smell of oil, diesel and the smoke of the camp fire. I suspected that by now our presence could be detected a mile down wind. Andi’s acid-punctured pants weren’t helping to upvalue our appearance in any way, and so orders were issued to restore a more civilized appearance. Thomas and Rainer took this literally. Perhaps I had exaggerated, however, the two made an impeccable appearance and could as well just have walked the high pile carpet at the local Ritz Carlton. Dressed up in their best clothes, polished shoes and freshly ironed shirts their sight in the middle of the desert reminded me on the survivors of the General Grant on the desolate shore of Auckland Island. ‘The same goes for our cars’, I addressed Marc and Sergey, pointing to a sizeable tree trunk on the back seat and the bleached skull of a camel that they had picked up somewhere and which was now staring at me through the rear window. The vehicle looked like a ride from a Mad Max movie. After I had put on a fresh shirt and Andi, with a heavy heart, had finally replaced his beloved but perforated pants by a new pair, we retreated into the car and waited and so did Marc and Sergey. When everybody was ready to depart, it occurred to Thomas and Rainer that their tank was almost empty. In their evening wardrobe they got out to conduct a refilling operation in the blowing storm. It was predictable what would happen, yet the details of the performance were quite entertaining. From behind the windshield we had a splendid view and the grin on Marc’s face in the car next to us told me that he and Sergey were equally enjoying the presentation. When Thomas opened the back door to pull out the canisters a camping chair got caught in the wind, sailed and jumped across the plain and first had to be recaptured. Then our friends noted that their only full canister was the one without a filler pipe. By the help of a funnel an attempt was started to transfer the content of the makeshift jerry can into the steel canister for which we had a filling neck. Due to a failed assessment of the wind direction this first attempt was quickly abandoned. After all equipment was carried over to the lee side of the car, the filling was continued. During the whole operation the two tried to prevent the inevitable diesel spray from ruining their wardrobe, which resulted in a variation of peculiar moves that Andi and I commented on in the tone of a sports commentator. After the steel canister was filled the actual refilling of the car could begin. At first the manoeuvre started out perfectly coordinated. However, when Thomas lifted the heavy canister and Rainer inserted the filling pipe in the neck of the tank it made a muffled clank and the device, obviously only poorly attached to the canister, had disappeared into the filling hole. This had the unfortunate side effect that, before Thomas in his surprise could lower the canister, a gush of diesel poured first on the mudguard and from there in every direction and particularly on the shirts and trousers of the refillers. In the pause that followed, despite the storm, we could hear only poorly suppressed laughter from the neighbouring car. After all attempts to retrieve the filling neck, which now firmly stuck in the abyss of the tank, had failed, Thomas came over and knocked at my window. 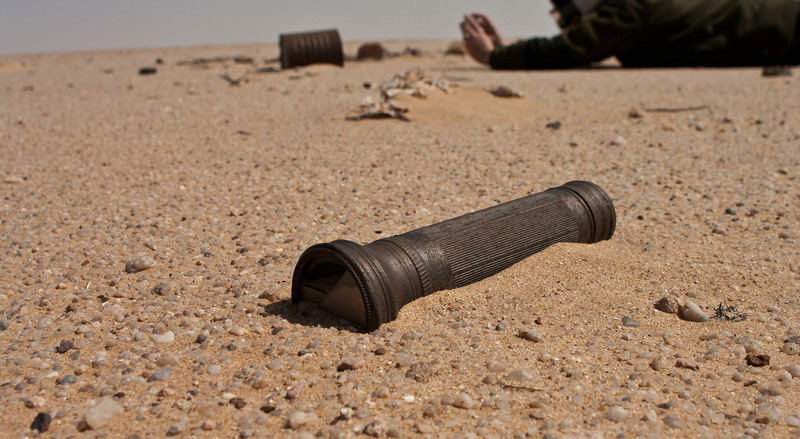 ‘You still have that aluminium rod you rescued from Marc’s tent?’ ‘Uh, you mean the useless-ballast-aluminium rod?’, I replied in feigned ignorance, fighting hard not to burst out in laughter myself. ‘Exactly that one’, he grunted. I handed him the pole and we watched as he fished for the stuck filling pipe in the tank while Rainer was assisting with a torch. After several near successful attempts the plan worked out and the pipe was reattached to the canister, this time with a cable tie. Ten minutes later the operation was completed and we finally departed. In Thomas’ defence I must admit that a few days later the filling pipe fell into our tank and this time I was the one to blame. The high speed traverse of the Imrikli Labyad was an event in itself. I won’t go into details here, but the journey convinced us that our cars were capable of things we hadn’t imagined until then. It was already late in the evening when street lights appeared at the horizon. Minutes later we reached the outskirts of the small coastal town. A hotel was found and although it had little similarity with the Ritz, its rooms were equipped with real beds, decent toilets and showers and that was all that mattered. Before we could check in we had to wait for ‘Al Mudir”, the boss, and to our surprise this was a girl in her teens that spoke a fluent and very matter of fact English. A bunch of people, whom I suspected to be fellow guests, loitered in the lobby and eyed us with blatant curiosity. When I introduced myself I learned that they were not guests but the hotel’s staff. After I received my keys from the young lady in charge, I took my luggage and went upstairs, found room number 13, but for inexplicable reasons I couldn’t open the lock. So I went downstairs again and kindly asked for help. One of the folks sitting on the couch in front of the reception, a friendly young man who introduced himself as the housekeeper, went with me and tried several keys, but didn’t succeed to open the door either. The fact that none of the hotel keys were marked with a room number did not contribute to making the task at hand any easier. After none of the keys matched, the housekeeper tried another door, quickly found a matching key and announced that I had just received an upgrade to a much better room. I thanked the gentleman and finally dropped my luggage on the table and tested the bed, which proved to be exceptionally comfortable. After a hot shower and a shave I felt like a new being. Together with the others we went out for dinner and a green tea in a café at the busy nightly roadside. It was a quarter to midnight when we returned to the hotel. Totally exhausted from a long day of searching and the nerve-wrecking night drive, the prospect to sleep in a real bed was irresistible. However, when I tried to open the door of my new room with the new key I had been issued, to my great dismay the lock wouldn’t turn. For a couple of minutes I tried to work the lock pulling and pushing the door handle but to no avail. The matter was further complicated by the fact that the timer controlling the light in the floor was set to the ridiculously short interval of 15 seconds. For every new attempt to get the key into the lock I had to walk to the end of the floor where the only switch was located and back to my door again. This left another two seconds before it went dark and I had to repeat the process. After a few more unsuccessful efforts I quit and went down to the lobby for the second time today in order to ask for a master key, which they would surely have. The young lady who managed the reception raised an eyebrow. ‘Sir, are you sure you tried the right door?’, she asked in a professional tone. With a sigh I confirmed. This time she joined me personally upstairs, politely asked for my key and turned to the lock, but before she found the keyhole of course the light went out again. I went over to the switch and remained there to aid with illumination while the receptionist tried every trick in the book to unlock the door. Predictably it remained shut like the gates of Hades at Easter. While we spent the time with casual small talk on door locks, and the lady admitted that she considered having this particular one replaced, we were successively joined by the housekeeper, the guest manager, the security manager, the doorkeeper and the doorkeeper’s assistant and his brother, who all tried their lock-picking skills but failed one after the other. By now it was late after midnight and to my defence I must admit that I had difficulties to further apply the appropriate African composure that was necessary to endure the situation with dignity. Thus, to achieve some progress, when everybody was at their wits end, I politely suggested considering the use of force in order to open the door. The young lady cordially laughed at this proposal, and in a tone very much as if she was speaking to a silly child, she patiently explained to me that there was no necessity for breaking things, and that, here in Morocco, little problems like these would be handled differently. Great, I thought. Not only had the prospect of a bed just been postponed for the indefinite future, but I had also succeeded in giving the impression that where I came from people were permanently kicking in their doors at the slightest cause. and which is to say patience is the key to happiness . This was met with general approval. A lengthy conversation followed, and from what I could understand with my limited skills of the local dialect, it appeared that, after a diligent assessment of the situation with all its implications, the general consensus was that only a man of expertise in the field of lock-picking could help us now. I deeply appreciated this insight. At the same time wondered how to get hold of a locksmith at this unearthly hour. The early hour, however, seemingly did not occur as problem to anyone. And in fact, after a brief phone call, the young lady announced that an expert was already on its way and would be here shortly. Because I have had my share of experience with the local concept of shortly (When Allah made time, he made plenty of it), I mentally prepared for an extended waiting period. Again I had underestimated the capabilities of the smart hotel staff and was astonished, when just a couple of minutes later, bustling noise outside on the street announced the arrival of the eagerly awaited locksmith. The housekeeper and some of the other bystanders went down to receive him. I expected to see some serious looking craftsman carrying a heavy toolbox up the stairs, but nothing like that happened. Instead, there was some more noise, this time it strangely appeared to come from within my locked hotel room. Seconds later, to my great surprise, the door snapped open, unclosed from the inside and a young fellow greeted me with a proud smile inviting me to enter. This was the expert. Not a locksmith, as I had falsely presumed, but the owner of a large wooden ladder which now protruded into my open window. I burst out into laughter at the sight and everybody joined me, probably glad that the hotspur westerner hadn’t applied his notorious habit of busting hotel furniture. I thanked everyone involved, the handshaking found no end because meanwhile half of the city’s population had gathered pryingly in my hotel room. The young lady apologized once again for the inconvenience. This is a very nice hotel, I thought, after I saw out the last of my guests, and fell into the bed. My fellow companions, who hadn’t noticed the affair at all, slept late and so did I. The sun was long up when we met for a decent breakfast in a café close to the main road. There we sat and watched the busy morning traffic. Much to the dismay of later customers Marc had made a deal with the owner to purchase the complete stock of fresh bread and eggs in order to replenish our dwindling supplies. It was a beautiful day, the Moroccan food was excellent and so we ordered some more bread with honey and another can of green tea and relaxed in the morning sun. It was good to know that today we weren’t bothered with the usual tasks that were necessary in the field. Sipping at my Schai Ahtar, I noticed a donkey cart that had stopped at the next corner. On top of it, holding the reins crouched an old man who, by the look of the cargo, was on the way to the bazaar to sell some home grown vegetables. Among the piles of exotic products I spotted a familiar fruit. ‘Marc, check this out’, I pointed to the cart. ‘Isn’t that a watermelon?’ ‘Good idea, I’ll go and get it’, Marc replied, and off he went. We watched him bargaining with the old man, who appeared somewhat surprised at Marc’s request, but after a while he shrugged and sold him the big green fruit nevertheless. Our encounter with civilization was brief and by midday we were already back on the coastal road towards Al Ayoune. From there we would take the road to Es Semara which would lead us via Itqyi to the second search area that we had selected for the expedition. Our destinations were the plateaus north and south of the central part of the Saquia al Hamra. In particular we wanted to pay a return visit to the G’idat Amwizirat, the site of the spectacular eucrite meteorite that we had discovered in October 2010 as the first find of the tour after a long unnerving period of fruitless searching. From there we would continue north, cross the Wadi Tighzert and spend a few days searching the plateau south of the Grart Nwimissiat. 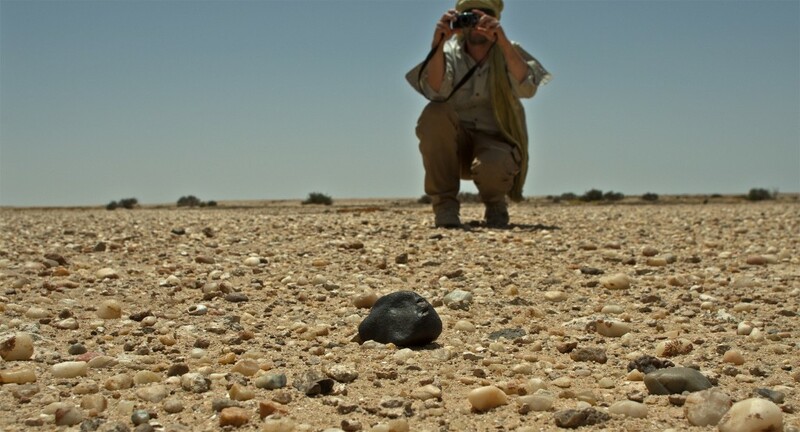 During our trip in 2010 we had found five meteorites there, and I was convinced that now, with a larger and more experienced team, we had good chances to repeat or even surpass our success.